At Tradesmen International, we are proud having earned the reputation as a go to source for skilled labor solutions around the country. 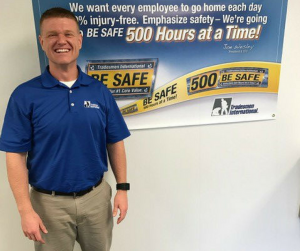 And we could not have done it without the hard work and dedication from employees like Chris Hall, a senior sales representative out of our Grand Rapids Construction Staffing Office. Please join us in giving a big tradesmen thank you to Chris for his 12 years of dedicated service and enthusiasm. Committed to the Tradesmen values of hard work and a commitment to safety, throughout the years Chris has continuously demonstrated an exceptional skill at building and fostering client and field employee relationships. And he is a big reason Tradesmen has become one of Michigan’s premier skilled staffing solutions providers. A big Tradesmen thank you goes to Chris for his dedication and commitment to the West Michigan construction industry.